A wheel wash system has been recently commissioned to prevent track-out from vehicles exiting a demolition materials recycling facility in Dandenong, Victoria. 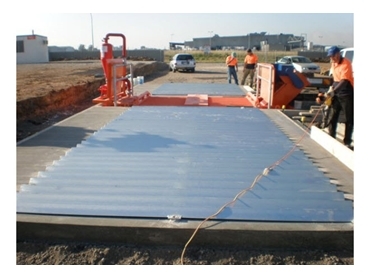 Supplied by Accuweigh ’s Melbourne branch, the wheel wash system also includes two sets of shaker grids to assist with the removal of heavy clays. Accuweigh’s AccuWash wheel wash system is highly water efficient and uses two separate water cleaning processes to clean recycled water, totally eliminating the need to replace dirty water from the onboard holding tank. An automatic sludge conveyor scrapes solids from the bottom of the holding tank into an external collection bin which is easily removed by a forklift or similar for emptying. An optional centrifugal solids separator then removes suspended particles such as sand, soil and grit to significantly improve water quality. The recycled water from the AccuWash wheel wash system not only prevents clogged spray nozzles but also prevents pitting of truck paintwork and potential damage to underbody mechanical components. Dirty water sprayed at high pressure can have a similar effect to sand blasting and Accuweigh’s solids separator totally eliminates this potentially damaging occurrence. The captured particles can be ejected from the separator manually or the AccuWash wheel wash system can be configured to perform this chore automatically by timer control. Accuweigh has a full range of wheel wash systems available; from a basic wheel wash bath up to the fully automated and self-cleaning models designed for washing hundreds of vehicles per day. No other wheel wash company can provide the after sales service commitment that is available from eight Accuweigh branches covering all mainland states.